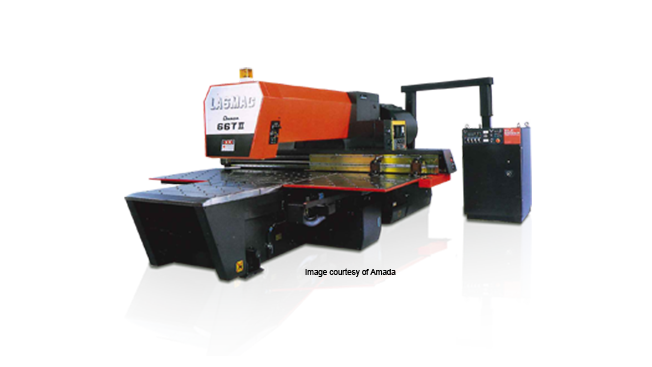 The Amada LASMAC LC 667 II is among the first sheet metal laser cutting machines created by Japan's manufacturer Amada. The laser is powered at 3,500 watts with the laser type being CO2-Laser. The X/Y working range for the CNC machine is 1000x1000 millimeters. The cutting speed ranges between 0 and 12 meters per minute. The positioning speed for the X Axis and Y Axis is 24m per minute. Amada's CNC laser cutting system, LASMAC 667 II, is very effective when using NC code produced by SMP/IS. If you're looking into the LC series from Amada, be sure to look at the Amada LC 667.